It’s been seven months that Michael’s been gone. I still think about him everyday. He’s still the first thing I think about in the morning, the last thing I think about at night. He’s still in my thoughts a thousand times during the day. His clothes no longer hang in the closet, but his truck is still parked in the garage. His phone seldom rings, but he still receives mail regularly. Each day ticks by without him. Wedding plans are in full swing at our house. Last week a precious young friend gave birth to a baby boy, beautiful and healthy. And just this weekend we learned that my our grandchild will also be a boy. Both babies will carry Michael’s name. So it begins. This is the way it starts, I suppose. Somehow my focus is shifting from the months past to the months ahead. It’s hard not to look forward to the promise of babies and new futures ahead. It’s a welcome diversion to shop for white lace and blue booties. While I certainly want to forget the pain of grief I never want to forget the joy of our lives together. I want the fun and laughter to go into the next generation of family and friends. I still don’t understand why Michael is gone while I am here. But I trust it to God. And for some reason He has chosen for it to be this way. So, for as long as He puts me here, I want to live each day to the fullest doing whatever He calls me to do in a way that will bring honor to Him. This is the bridge I choose to build between the past and the future God has given me. When I first met Michael, I was 17 and he was 18. People find it hard to believe when I tell them how shy he was back then. But his shyness was not an indication of a lack of confidence in himself. He always believed he could do big things. I, on the other hand, never had a problem being around other people or being shy. But don’t mistake that for confidence. I enjoyed being around people, going places and socializing, but when it came to having confidence in myself, that’s where I fell short. So I guess this is one of those places where Michael and I complemented one another. Together we were better than the sum of our parts. And in particular Michael always was the one who boosted my confidence in myself. He always thought I could do more, bigger, better things than I thought I was capable of. Especially in my appearance. I, like many women and girls, have a hard time having confidence in my own appearance and body image. Shopping has never been one of my favorite things to do. I tend to live a pretty casual lifestyle and I can usually feel comfortable with it. But it’s hard for me to go out and find a special new dress, get all fixed up and feel like I’m presentable enough. This was one of the areas that Michael really poured into my life. He always encouraged me to wear color. (Like many women, my closet tends to be 50 shades of black.) And when I would come home with a dress for a special occasion, especially if it were colorful, he would always make such a point of telling me how much he liked it. And when the occasion came and I would show up in our living room ready to go, he would make a point of telling my how beautiful I looked. On the way to the event he would look over from the driver’s seat and smile his wonderful smile. And he would reach out his right hand to me in the passenger seat and hold my hand. I think he always knew that I needed the extra encouragement and security of having him by my side. So these days, when a special occasion comes around, I find myself really at a loss. Though others may say how nice I look, there’s nothing like having the man you love say it. And I must admit that I’ve often found myself midway to where I’m going with the distinct urge to turn around and run back home. I hear that voice in my head saying, “This is a mistake! Go back home!” I walk around on the edge of breaking down and sometimes have a hard time talking for the huge lump in my throat. It takes more courage than I have to keep going and often I just want to quit. I’m thankful for those close to me who encourage me and include me and cheer me on. I hate to admit that while I’ve tried to raise two daughters to be independent and self-confident, their mother’s confidence has been tied to their father all these years. It always feels like I’m the only one in the world with these feelings of inadequacy. But I also know that I’m generally just an average person, so I’m sure there are others out there that have these feelings too. As I read back over what I’ve written, there are two things I would tell anyone who reads this post. First, this is not an attempt to solicit compliments. It’s just where I am as I move through this process of learning all the times and places that Michael’s presence is especially missed. Second, as Valentine’s Day has just passed, I would say to husbands and wives, to be sure to appreciate one another every day. Encourage and invest in one another like only a spouse can, for your words and actions have a value greater than anyone else’s. It’s been almost seven months since Michael’s been gone and I can’t seem to dream. Particularly, I want to dream about Michael. I’ve even prayed and asked God to let me dream about him. I so want to see his face again and to hear his voice. I even know that when I wake up it’s going to be miserable to realize again that he’s not here. But I don’t care – I’ll willingly be miserable for a few minutes of believing I’m with him again. Several friends have told me they dream about Michael. Our kids sometimes dream about him. One friend told me back when Michael was in ICU that he’d had a dream that he and Michael were out having lunch together at a restaurant. At the time we thought that was a good sign and that everything would turn out alright. Others have had dreams of Michael telling them different things, laughing or playing pranks, or even fussing with the guys out on a job site. I readily admit I’m envious of their dreams. I’m even getting desperate for a dream! When Emily and I recently travelled to Africa we were required to take anti-Malaria medicine. One of the side effects of the medicine for lots of people is vivid and crazy dreams. So I’ve actually been looking forward to taking this medicine! A few days ago I took my last required dosage of medicine. (Dare I take more just to dream? I told you I was getting desperate!) In the three weeks of taking the medicine I only had one episode. It was so brief I don’t even think it qualifies as a dream. One night Michael was standing in front of me and put his arms around me. And just that quick it was over. I didn’t even get to look at his face or hear his voice! It was maybe two or three seconds! It took longer for me to type this sentence than it did for the dream! I tried to go back to sleep and make it happen again, to make it last longer. You know what I mean. Haven’t we all tried to return to a dream? But no luck. I don’t put much stock in trying to analyze dreams. I don’t generally think they have deep meaning or are divinely inspired (except on rare occasions). I generally just think dreams are the thoughts and sounds that our mind thinks when we’re sleeping, oftentimes influenced by what we’ve done or thought when we’re awake. It’s not too hard to analyze what my little mini-dream meant. Happy Birthday! I don’t know if you celebrate birthdays in heaven or not. Part of me suspects that time and dates of birth and death are insignificant to you now. But here we continue you to celebrate you and today especially. I remember all the birthdays we celebrated together, some quietly, some with great fanfare, some lavishly, some with simple family meals. But all to show our love for you and the wonderful family we became. I also remember that each of your last three birthdays here were spent, at least in part, in the hospital or emergency room. While I certainly miss you, I don’t miss those kind of birthday celebrations. Do you remember how many times your birthday would fall on Superbowl Sunday? Well, it’s happened again. And many times we would celebrate by inviting friends to a Happy-Super-Birthday-Bowl party to combine the two events. Well today we celebrate both events, but just a few of us. By the way, we have no home team in the game this year. Not like a few years ago when we cheered and whooped it up in the living room when the Saints won. The kids are all here to celebrate. They’re doing well and it’s always wonderful to have them home. Inevitably we laugh and throughout the day somebody will say “Dad would say …” or one of them will make a Michael face about something. Then everyone will laugh and recall all your antics. Emily and I just returned from our trip to Africa. (Yes, she finally got her college trip!) You would have been proud of how brave I was to go so far away from home. The trip was incredible and I constantly thought of how you would have enjoyed it – just like all those National Geographic shows you loved watching over the years. Now she and Casey are busy finalizing their wedding plans and getting mom and dad’s house ready to move into. And, of course, she’s working on passing her test and getting a job. Andrew is back in school and working hard at the church. His days are long but he loves all the challenges. He will be ordained in just a few weeks. Christy and Jason are also well and will make us grandparents in July – finally we’ll be “Gigi and Pops” like we always talked about. We’ll know in a few weeks if it’s a boy or a girl. Your mom is doing well and your sisters are taking good care of her. In fact they’ve taken her to Alabama to celebrate Peggy’s birthday too this weekend. I try to stay busy with the various business ventures and other projects we’ve created. MGM actually has a little project we’re building for the seminary – I know you’re just shaking your head over that one! All the team are pulling together to make it happen. The farm and beach house are doing well. I have more plans to travel this spring. It’s been over six months since you’ve been gone. Six months since I’ve seen your face and had you whisper words to me. 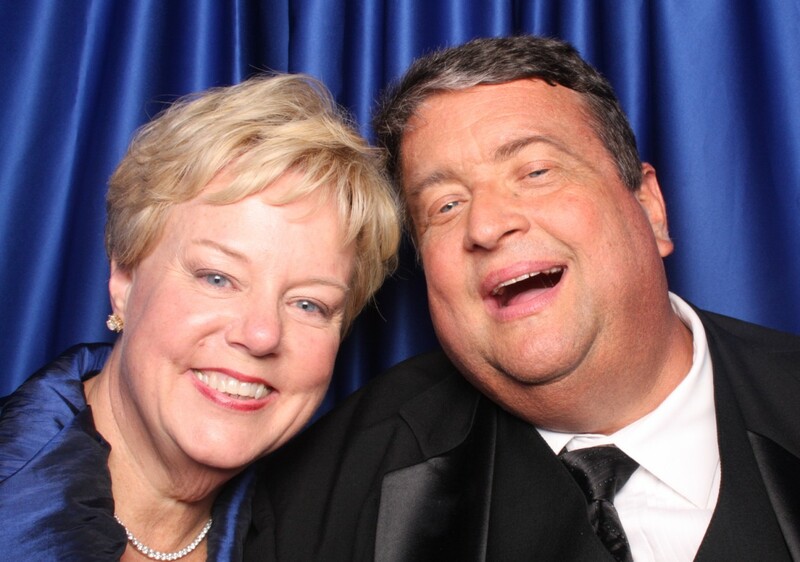 Six months since you’ve smiled and made those silly expressions you always made. Each day the sun comes up and goes down. Each day I wonder why your side of the bed is cold and empty. Each time I see your gravestone I can’t believe my eyes. You are well remembered here. Friends call and come by. They are patient with my tears and remembrances. I know we never liked having our names attached to things, but there have been many honors established in your memory – awards for Christian service, scholarships at colleges and hospitals, even a community garden. It seems that your visions shared with others are continuing to develop even after you’ve gone; which I guess is the best memorial of all – that you were able to inspire others to action. There were no presents for you to open this year – you were always so hard to buy for anyway. But instead the kids each received a gift from you. A little something to keep them warm, hopefully to comfort them on those hard days, made from so many of your old shirts. You know all the old T-shirts you wore constantly, the khaki pants that were a part of your daily life, the “Big Dog” logos you were so fond of, and even a few of the button down dress shirts and ties that rarely saw the light of day. Now they will go forward with the kids to wrap themselves up in. You would say the blue backing is just the right shade to show off your “beautiful blue eyes”. 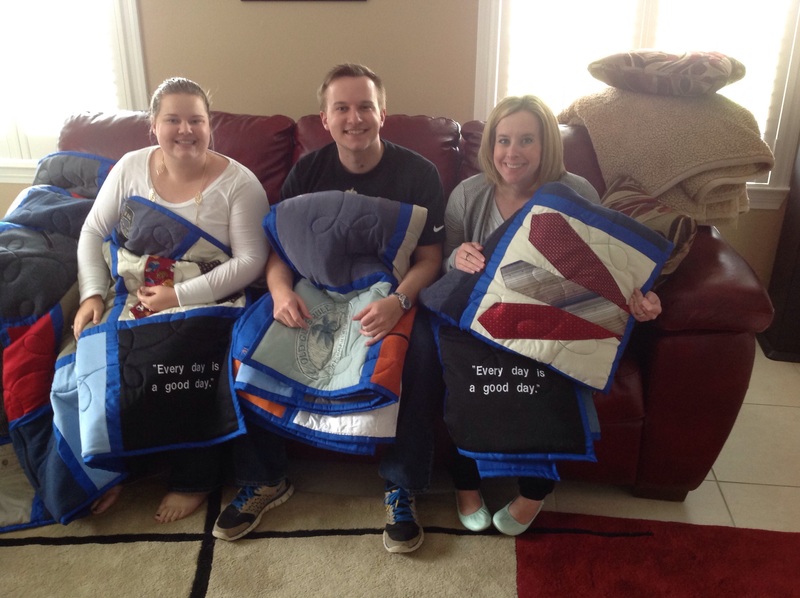 And each quilt will remind the kids that “Every day is a good day”. No, I don’t know what birthdays are like in heaven. But I’m sure by now you’ve had wonderful reunions with mom and dad, so many of our aunts, uncles and grandparents, and most especially your dad. I can just imagine how wonderful it was to see him again, feel his hug and hear him say how proud he is of you. I imagine you holding and loving on that baby we never got to know. I don’t know if there are special celebrations for you today, but I’m sure nothing compares to just being in the uninterrupted presence of God. What better gift can there be? I am envious. Please know that we do our best to carry on and to make you proud. You are never forgotten and never gone from our hearts.